We live in the land of Land O' Lakes and that makes me a very happy girl! We always have the good stuff here in MN! putting butter on bread and then sprinkling cinnamon sugar over it. so, when we were given the opportunity to try it all in one, I snagged the chance. First we made mini waffles and those were delicious! (photos coming when I get home). We're big waffle & pancakes fans and eat it often for dinner. My son always has mini chocolate chips and this time he added the Land O' Lakes Cinnamon Sugar Butter to top it off! He was a happy camper! recipes you can make with this popular flavor pairing. Now Land O’Lakes makes it easier for you to spread a little sweetness with the new LAND O LAKES® Cinnamon Sugar Butter Spread. Watch the smiles around your kitchen table grow with every bite of this delightful butter added to your favorite breakfast foods and other dishes. It’s a simple way to get your kids to eat breakfast and start the day right when they can add a dollop of sweetness to their favorite foods. LAND O LAKES® Cinnamon Sugar Butter Spread contains cinnamon and sugar swirled into creamy, all-natural butter. It has no artificial ingredients. Made from simple ingredients, such as cream, sugar, canola oil and cinnamon, LAND O LAKES® Cinnamon Sugar Butter Spread can be used for spreading, topping, cooking and baking. Tasty and versatile, LAND O LAKES® Cinnamon Sugar Butter Spread is great on toast, hot cereal, baked apples, vegetables, and much more. Learn more about how you can add LAND O LAKES® Cinnamon Sugar Butter Spread to your favorite foods at www.LandoLakes.com or on Facebook. With a little bit of sugar, spice and everything nice, create new memories at home with sweet and wholesome breakfasts, savory dinner ideas, and twists on delicious sweet treats and desserts. 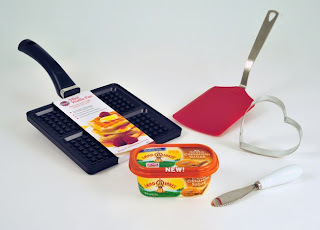 Now's your chance to win the prize pack from MyBlogSpark and Land O' Lakes!! Required: Tell me what topping you usually put on your pancakes or waffles! Tweet this giveaway & leave a link 2 your tweet (1 entry daily) “RT Win a Land O' Lakes Cinnamon Sugar Butter Spread Prize Pack! @landolakesktchn @MimiBakerMN #MyBlogSpark http://bit.ly/pazSG7"
Disclosure: The LAND O LAKES® Cinnamon Sugar Butter Spread product, information, and giveaway have been provided by Land O´Lakes through MyBlogSpark." We've been enjoying this on toast for breakfast. It's so good! I LOVE Land O Lakes. It's the only butter I buy. I "like" Land O Lakes on Facebook. This new butter looks so yummy. I'm dying to try it. Yikes! Sorry, forgot to leave my email address. We usually have butter~syrup and sometimes honey! I usually put Land O Lakes and syrup on my pancakes and waffles! I always top my pancakes with strawberry preserves! I like Land O lakes on FB! My husband and I love to eat butter spread and maple syrup on our pancakes and waffles! I just use Log Cabin Syrup on my pancakes. Butter and maple syrup! yum! I usually like Cane Syrup on My Pancakes! I use butter and syrup if I have it, if not I use jelly. Sometimes I have a wild hare and eat them plain. Lol. Like Land O Lakes on FB. I like butter and maple syrup on my pancakes! We usually use maple syrup on pancakes. This would be fabulous as cinnamon toast. We usually put syrup on waffles, but cinnamon butter sounds great! I just put butter and honey on my pancakes. Imported Irish butter and organic California desert honey. We usually put maple syrup and butter on our pancakes. Pure maple syrup and butter goes on my pancakes! I put maple or strawberry syrup on my pancakes and waffles. I usually add butter and maple syrup on my pancakes or waffles. #1 - I’m a subscriber via RSS Feed. #2 - I’m a subscriber via RSS Feed. I put blueberry syrup on top of waffles. I usually just put on a little butter and some syrup. Sometimes I add crushed almonds. I use butter, cinnamon, and syrup! Butter and syrup is my topping of choice. Thanks. 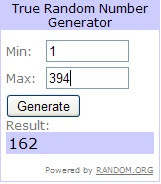 I entered the Farm Rich giveaway. I usually use butter and maple syrup on my pancakes/waffles. I put syrup on mine! I put fruit jam on mine. I usually put whip cream and strawberries on my pancakes or waffles. I would like to try the Land O Lakes cinammin sugar butter spread on toast. it sounds delicious. We're plain Janes and just do butter & syrup on our waffles/pancakes.